You've done the hard work and found some amazing artwork for your home, but how to hang it!? This blog post isn't going to tell you about how to hammer a nail into a wall, we're stepping it up a notch. Instead it features a number of creative ways to arrange and hang artworks in your home to create the perfect gallery wall. Bringing together your collection of paintings, prints or photographs in a beautiful arrangement can really create a wonderful feature wall for any home. But depending on your collection and their varying sizes, certain styles might suit more than others! Below you'll find some inspiration on a number of different and exciting ways in which to hang artwork for your home. It's only right to talk about the original way to hang artwork first! The salon hang dates back to the early nineteenth century in France, where artworks were positioned in a hierarchy on the wall, with historical and religious depictions closer to the viewer and still life and portraiture at the highest point of the wall. Due to the amount of artists in France at the time, the walls were filled to the brim with artworks of different shapes and sizes. Now I'm not saying you have to be as bold as this to create a gallery wall in your home, but perhaps the below is a good example of how to get started! To bring this style of gallery wall into the 21st Century, begin with either a recurring colour, a medium (e.g drawings), a theme (e.g portraits or figurative artwork), a style of framing (e.g metallic) or an artist. This creates the base layer of your salon wall which is more consistent. From here you can layer on additional details and highlights which draw your eye around the arrangement. For example, a splash of red in a painting, can be matched with say a family photo or print with red in it. If you're lacking enough artwork to fill your salon hang at present, you can even team the artwork with mirrors or empty wooden/metal frames for a more quirky look until you find the perfect addition. The salon hang is great to look at, but it can also mean a lot of holes in your wall! If you're conscious about the amount of holes you're creating then a great alternative is a picture rail. These can be seen in some contemporary galleries, but again the style dates back to the french salon. This type of hang is better for paintings and different mediums on the heavier side, as it provides a more stable display. An added benefit is that it's also easy to change around the artworks and the display itself! Chains are hung from a rail or wall moulding and the hooks at the back of your picture are looped through the chain links (see how here and here). This creates a sturdy and level wall mounting option which is easily restyled and adapted. The chains can be slid along, linked and unlinked to create different heights or widths appropriate for your collection of artwork. Consistent sizes, frames and style give this display the look of a large piece of artwork at a fraction of the price! This type of hang works really well when all of the artwork correlates, and this is best achieved by buying from the same artist as they will usually have a collection of similar artworks. Some artists even focus on a particular theme for a body of work, such as album covers, iconic cityscapes or perhaps animals, which can make for an eclectic collection with a common connection. You might find buying a collection of original prints or drawings from the artist an affordable way of bringing together lots of their work in this manner! Photography is also a great option as prints will usually all come in exactly the same dimensions and format - perfect for a uniform collection. However, if you'd like a more personal touch you can always consider hanging pictures of your family! Buy consistently sized framed and print them yourself - maybe all in black and white to create a classy feel. Again, the leaning display is a great way to show off artworks if you're conscious about holes, or due to large furnishings, you feel there isn't enough room for the art works to be hung on the walls. You can layer different-sized, small to medium artworks on top of a chest of drawers, fireplace or little ledges found around the home. If you have a piece that is quite large, this can be placed on top of a solid piece of furniture, or even on the floor leaning against the wall, with smaller artworks in front. 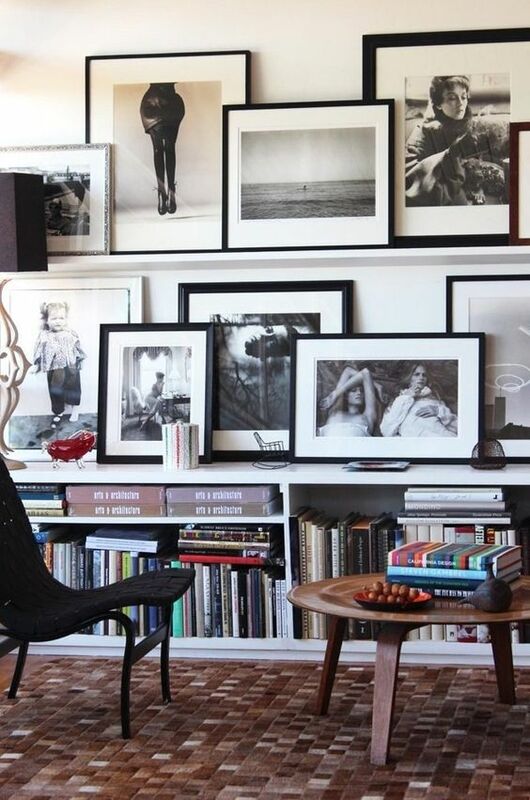 The great thing about this style of gallery wall is it is easy to rearrange, just pick it up and move! Creating a shallow shelf is another great way to really bring this style to life. It's fast becoming a popular choice for those who want to maximise their wall space yet have a larger collection of artwork, photographs and objects they want to display. I think this display is best for a mixture of photographs, prints or illustrations, bold images, pop art-esque or small paintings, small sculptures or prized possessions. The layering of artworks and objects creates depth and visual interest. Depending on your style you can have a mismatched theme or a uniformed monochrome look. The staircase is usually overlooked in the interior design department, however you can easily make it a beautiful feature within the home! Using similar or different artworks featured above and below, you can create an interesting staggered effect that fills the unused space. You can take tips from both the salon gallery hang and the uniformed gallery display to create a collection of artwork that suits you and your home. Consider uniform frame colours as above, or similar artwork colour tones as below. Get a couple of friends to help you holding various items in place so you can picture how the collection will come together on the wall. Below is also a sample arrangement which might give you some inspiration on how to mix big and small! Once you've decided on any of the above gallery wall styles, 3 final tips can be useful for actually implementing the designs in practise! Thanks for reading! And why not check out our full collection of artwork to make your own gallery wall! or you can use gallery wall stencils for inspiration!